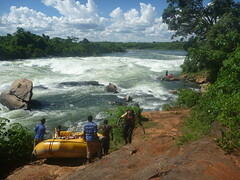 We contacted Nalubale Rafting when we arrived in Jinja at the suggestion of a friend. On price alone Nalubale was 30%-40% cheaper than just about everyone else in town and on that recommendation alone we were sold. After speaking to the owners/guides about the river levels and the river-boarding we preferred to do, we were also sold on the personalized level of service we were about to receive as well as their river knowledge as well. 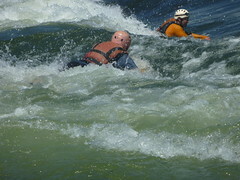 We are two whitewater kayakers, know many whitewater rivers, and know the difference between someone just trying to sell the river and someone who actually knows and respects its dangers. Working mostly with Reuben, we were told that the river was a little low for river-boarding but that we could take the boards and fins and do it whenever we could. The morning was a bit slow to start on account of finding boards and fins for the three of us but even with that delay we were still on the water ahead of the other rafting trips. A quick lesson on using the boards in the river and we were good to go. Throughout the day Reuben was a perfect guide. Leading down good, clean lines so that we had fun in the rapids rather than a bad time. On those rapids of questionable difficulty he was clear in articulating the dangers and advised us when it was best to get into the raft and off the board…the final decision always left to us. Our day on the river could have been a lot worse but I don’t really see how it could have been any better. The extras were also top notch. The food provided to us, three small meals, was far more substantial than the one or two snacks I’m usually accustomed to…and then beers and sodas for the ride back to Jinja as well. Logistics were all handled well and with three safety kayakers monitoring the three of us at all times we were never in any danger. I am not sure but I believe shuttles to Kampala and camping sites can also be arranged at no extra charge. The most difficult part of the day was that we were staying at the Nile River Explorers Backpackers, home to not only the only backpacker accomodation in town, but also one of the largest rafting outfits in the entire country. Their prices were higher and due to their size, the impersonal nature of the staff rubbed us the wrong way. Some managers were nice but others were the opposite of helpful and really irked us. In the end I was extremely pleased that we chose not to go down the river with them.